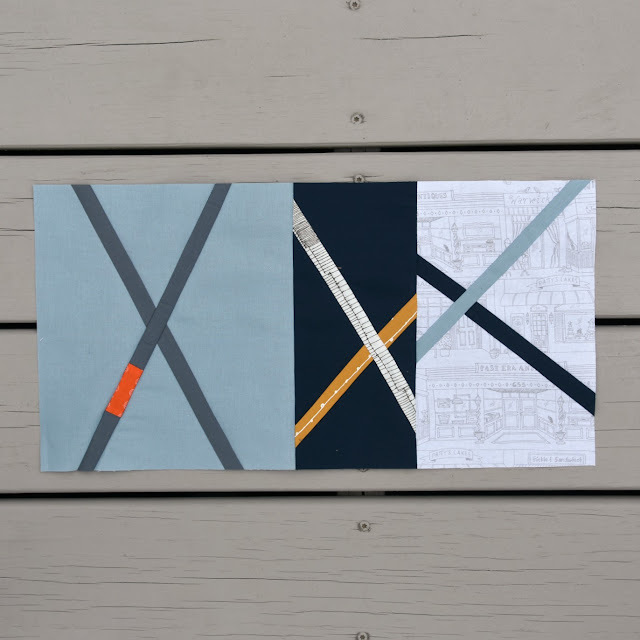 Starting in January, I have chaired the Modern Skill-Builder Block of the Month program for my local modern quilt guild, the Greenville Modern Quilt Guild. The program includes one modern block pattern every month that focuses on building sewing and modern design skills including improvisational piecing, curves, paper pieces, applique, Y seams, and use of low volume prints. These blocks are a way of trying out and learning new skills and techniques. The block of the month is announced at a meeting and then at the next meeting participants bring in their blocks which will be used to make charity quilts (or they are free to keep the blocks for themselves). Here are the free block tutorials we used for the first 3 months of the year along with my versions of the blocks. You can click on the block names for a link to the tutorials. 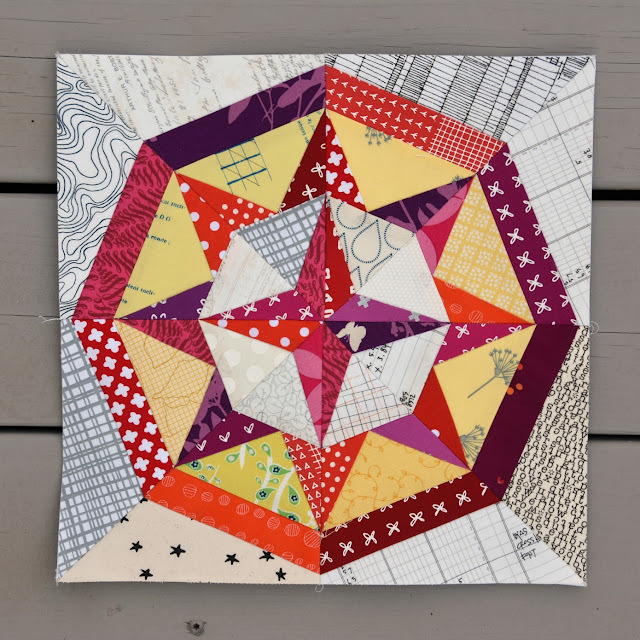 Cath makes some fabulous paper pieced designs and I thought that one of her many star designs would be perfect for the guild. This block using paper piecing and low volume fabrics. 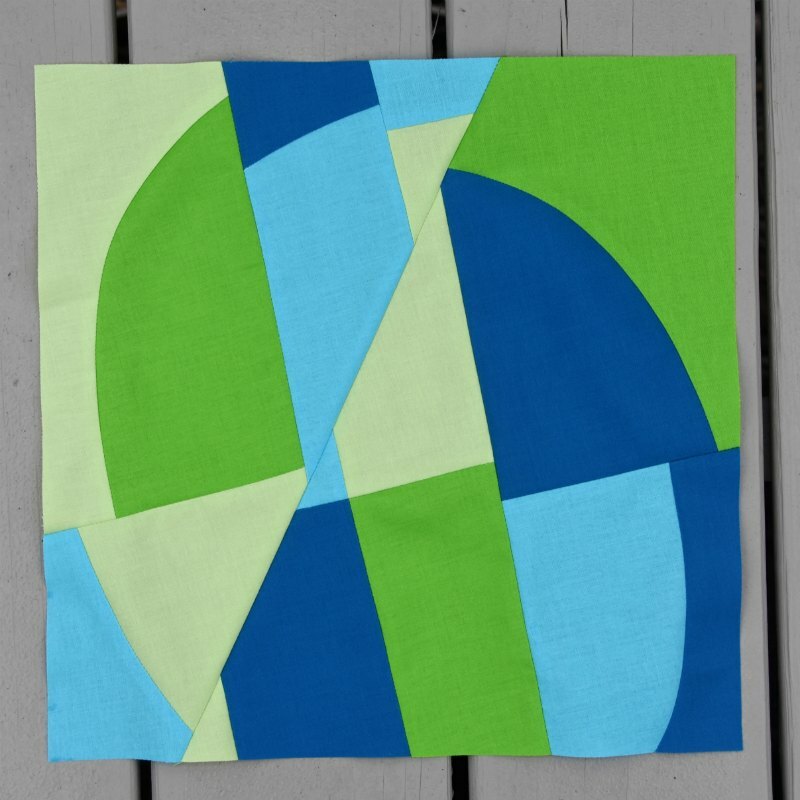 Debbie's block is a great introduction to improv piecing and a variation on the slice and insert method. Plus, she has great tips to make up the inserted lines when sewing the block back together. I hope you can share some of the charity quilt finishes when they get made. This is a great idea for a guild! Terrific blocks! Fun to see you using one of mine. ;-) I hope the group has fun with it! These are a great set of blocks! Some of them look pretty challenging too! My local guild has a monthly block lotto and I kicked this year off with a skill-builder, having them tackle Y-seams with tumbling blocks. Monthly blocks are a great way to get members out of their comfort zones. Thanks for passing these along! Very fun blocks! I really like snowball, very pretty.